Back when I was single, road trips and holidays were pretty simple. I’d pack my bag with my stuff and head out. I could leave whenever was convenient for me and stops along the way were only dependent on my appetite and my bladder. Since becoming a parent, things have gotten a bit more complicated when I travel with kids. My husband and I have three kids, aged 10, 6, and 3 as well as two very different work schedules. 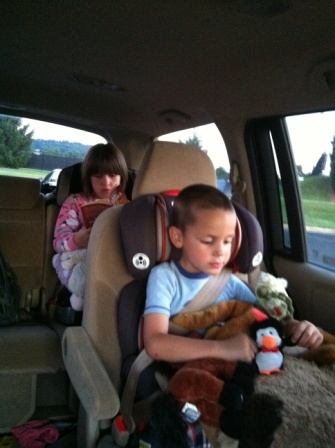 Still, I have learned a few things that are helpful for other parents about to travel with kids on the road. First, I’ve discovered that a lot of the planning discussions are best kept out of little one’s earshots. Internalizing the passage of time requires some higher level thinking that kids younger than 6 or 7 just aren’t capable of. In layman’s terms, if you mention an upcoming trip to a six-year-old, you are likely to hear, “Is it time to leave yet?” every hour for a week (or longer). On the other hand, some kids need more preparation for changes in their regular schedules and routines. You know your kids best, so just think about their personalities and temperaments before you mention that awesome trip to Disney World three weeks before you leave! When it comes to packing, I typically leave it until the night before. Part of that is procrastination, but part of it is because of what I mentioned above. Each of my kids has their own suitcase. For road trips this works out quite nicely. (If you are traveling by air or rail and you are subject to baggage limits, you’ll have to take that into consideration.) I lay the suitcases out in the living room floor and have the kids gather to help pack. My kids are old enough to dress themselves and put away their own laundry, so when it comes to packing that can be quite helpful. I name an article of clothing and give them a number. For example, “Bring me six pairs of underwear.” They can each do that independently, although big sister does offer littlest brother some help. I usually take the number of days in our trip and add one for each item of clothing. For newly potty-trained kids, I’d add two or three, and I always overestimate on the underwear! I don’t ask them to pack more than 7 of each item, because if we are going to be gone that long, it’s usually worth it to wash clothes some time during the trip. Plus, most of our long trips are for visiting family anyway. As the kids bring me the required number of clothes, I pack them neatly into the suitcases. When all the clothes are packed (don’t forget PJs, and other special occasion items like church clothes or swimsuits if needed) I allow the kids to add some toys, books, or loveys to their suitcases. We have a travel bag with toothbrushes, toothpaste, shampoo, and other toiletries that is perpetually packed. I double check that all the supplies are full and then that bag gets placed in the emptiest suitcase. Then they get zipped up and go straight into the car. When it’s time to get the kids in the car, I let them bring one special item with them to the vehicle. My van already has a bin of travel toys in it, so that’s something I don’t have to pack, per se, but it is nice to have in there when we need it. When we travel with kids, our travel bin is actually a canvas storage cube filled with coloring books, crayons, puzzle books, and small toys that the kids don’t regularly get to play with. Their favoites are old Highlights magazines, Magna-Doodle type drawing toys, and an assortment of little figurines from the Dollar Store. There are also some fun “car BINGO” games you can print off from various websites before you go. My middle son, especially, likes just looking out the windows at all the different things going by. Some people also swear by DVD players, but we don’t have one and my kids have always traveled just fine without them. 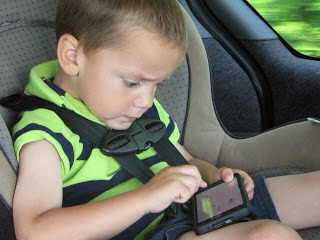 We do have smart phones and iPads that we occasionally let the kids play with in the car. If you don’t remember it from your own childhood, I’m sure you’ve seen or heard jokes about it recently, but make sure everyone goes to the bathroom before you leave. Despite that precaution, though, someone always has to use the bathroom at some point during a road trip, so just know that it’s going to happen. And if one person has to go, then make everyone give it a try. You don’t want to have to stop every ten minutes! Another thing kids (and adults) will often need on long car rides will be food. Different families have different rules about food in the car, but we have found these things to be great for car rides: water bottles that can be refilled along the way, gummy snacks, applesauce pouches, cheese crackers, and granola bars. We also keep a supply of gum in there for my daughter who has ear issues when there are hills to be transversed. Just remember, what goes in, must come out, so prepare for bathroom stops. What time you reach your destination will depend, obviously, on what time you leave. Personally, I find that leaving right after work/school makes for a late evening, but a quicker trip as the kids tend to be tired aleady and will often fall asleep in the car. If that’s the case, the kids will often change into their pajamas before they get in the car. When we’ve tried to leave early in the morning, we always seem to get sidetracked and behind schedule. If leaving early in the morning works for you, I recommend packing the vehicle the night before. Your schedule on vacation is never going to be the same as your regular schedule. You might as well just get used to that now. Kids get overwhelmed with lots of new things and may get more cranky than usual. They don’t often sleep as well in an unfamiliar location, so being tired during your trip is to be expected. It’s really important not to overwhelm your plans with an intinerary that is packed from rising to bedtime. You are just setting yourself up for disaster. Another thing that happens to us is that kids who are normally in sync when it comes to meal times and bedtimes will fall out of sync with each other while on vacation. This means that our earliest riser at home might often sleep in and our first to sleep at home may become a night owl. Children, like all other humans, are individuals, so how travel affects them will be different from how it affects their siblings. I am typically a very optimistic person, while my husband is the pessimist. When we travel with kids, I tend to adopt his “expect the worst and you’ll never be caught off guard” mentality. That doesn’t mean that I don’t enjoy traveling with my family. It just means that I try to imagine the ways that things could go wrong, and that helps me to be prepared if they do. When it comes time to leave, do what you can to make your homecoming easier. When we stay at my parents’ or in-law’s houses, I wash all the dirty clothes the night before we leave. I pack them all in the biggest suitcase, and then pack the other suitcases with like items; toys in one, books in one, etc. Instead of packing for your destination, think of it as packing for putting it away. It’s nice to come home with just a small bag of dirty clothes instead of suitcases full of them. If washing clothes is not an option, then sort your loads into your suitcases: white in one case, colors in another, towels/blankets in a third, etc. Then when you get home, one case can go straight into the washing machine. After you get home, whether it was a trip to visit family, a camping trip, or a whirlwind Disney vacation, it’s nice to sit down together as a family and talk about the trip. What were the best parts? The funny parts? Who did you meet? What would you want to do if you went back again? Responses can be written down in a thank you note to Grandma and Grandpa, a family scrapbook, or a blog post. Recording those special family moments together will help them last. When did you travel with kids last? What trip are you planning for? Rabia can be found blogging on her family’s website, The Liebers, when she isn’t packing for her next trip. Like her on Facebook and follow her on Twitter and give her a “high five” for these amazing travel tips!